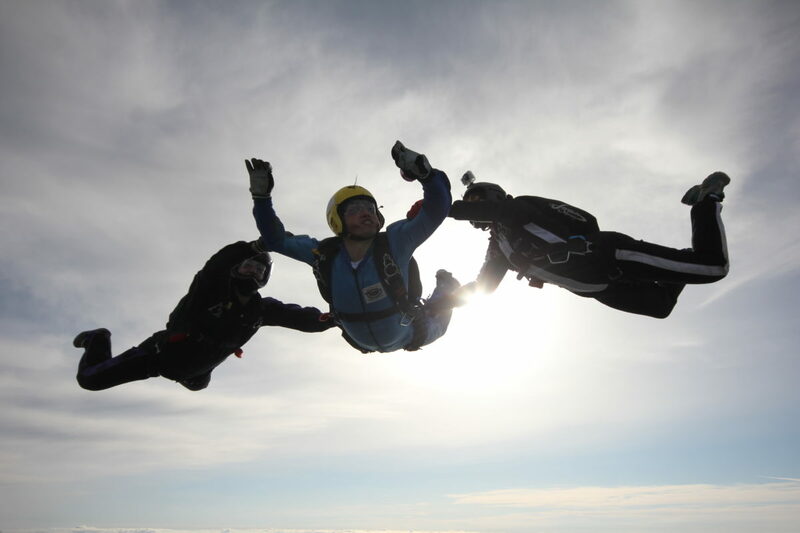 Accelerated Freefall is one of two ‘learn to skydive’ UK skydiving courses and is the quickest route to becoming a qualified skydiver. Also known as AFF, it’s Intensive, fast-paced and you can experience freefall on your very first jump. 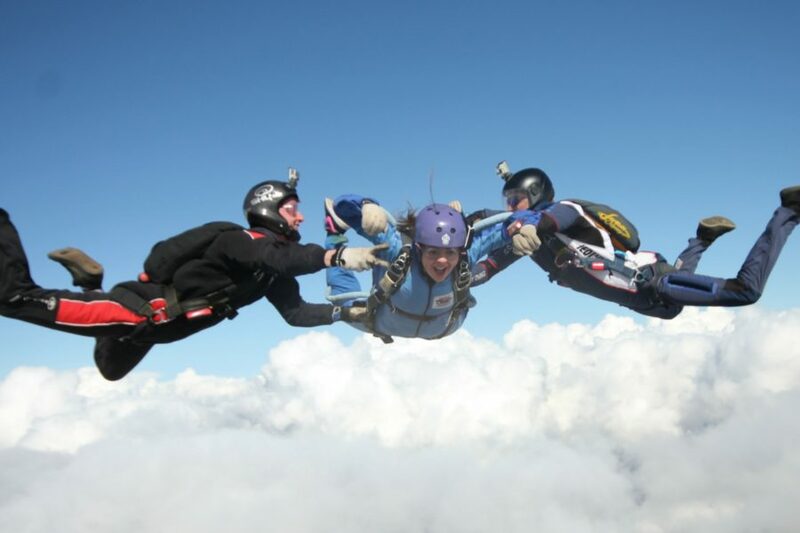 After one full day of ground-training you will have learnt all the skills needed to make your first skydive from 15,000ft, accompanied by, but not attached to, two expert instructors. You will then open and, fly land your own parachute. We offer the AFF level 1 course as a unique introduction to the world of parachuting and skydiving which allows you to try it out first. 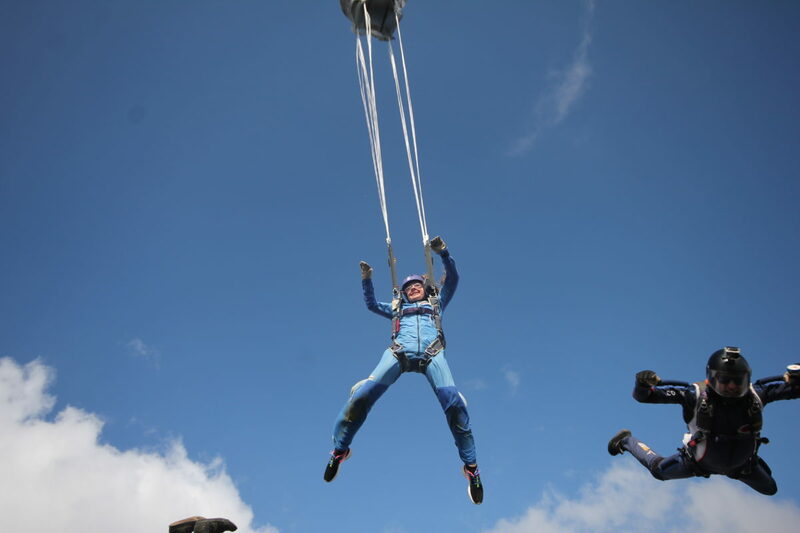 If you fancy something a little more challenging than a Tandem Parachute Jump, its great as a one-off freefall experience. 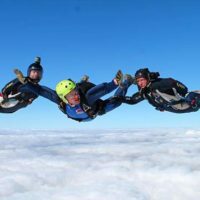 The full 8-level Accelerated Freefall course is the best way to learn to skydive and attain your license as a qualified parachutist allowing you to jump at skydiving centres across the world. 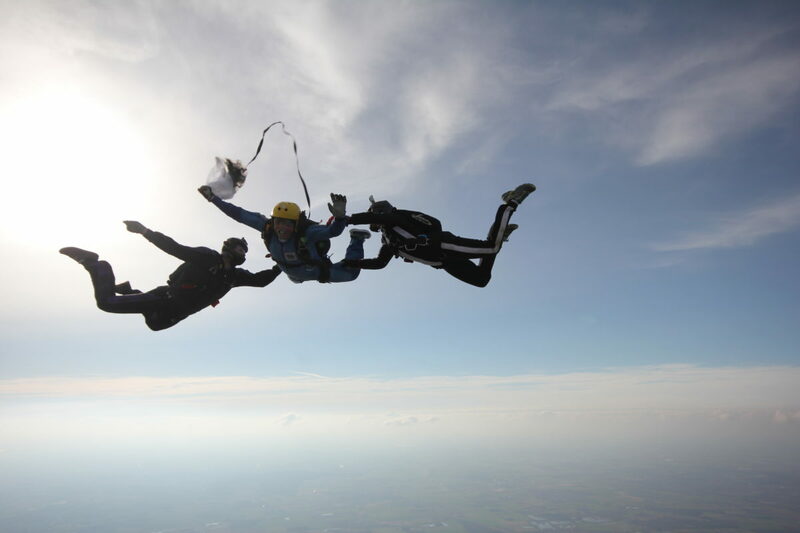 Jump solo on your very first sky dive from 15,000ft. Open, fly and land your own parachute. Be cleared for unsupervised freefall in as few as 7 jumps. Work towards obtaining your skydiving license. 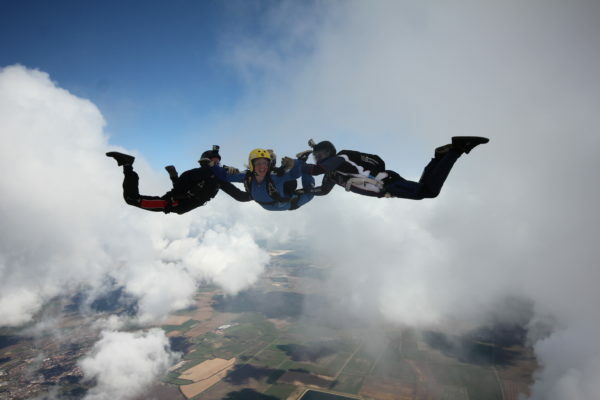 Skydive Hibaldstow also offers another method of learning to skydive called Static Line Parachuting. What Does AFF Level 1 Involve? Before you can jump you will complete an intensive day of ground training with one of our British Parachute Association (BPA) qualified AFF Instructors. The jump will take place the following day making this a 2-day course. 9am Your course starts with a Dropzone orientation. How your parachute equipment works and how check and fit it. How to board and exit the aircraft. How to maintain the correct body position, monitor your altitude and deploy your parachute. How to recognise the airfield and land your parachute. How to deal with any unforseen situations or emergencies. There will be a break for lunch around 1pm. The course will finish between 5 and 7pm with a written test. 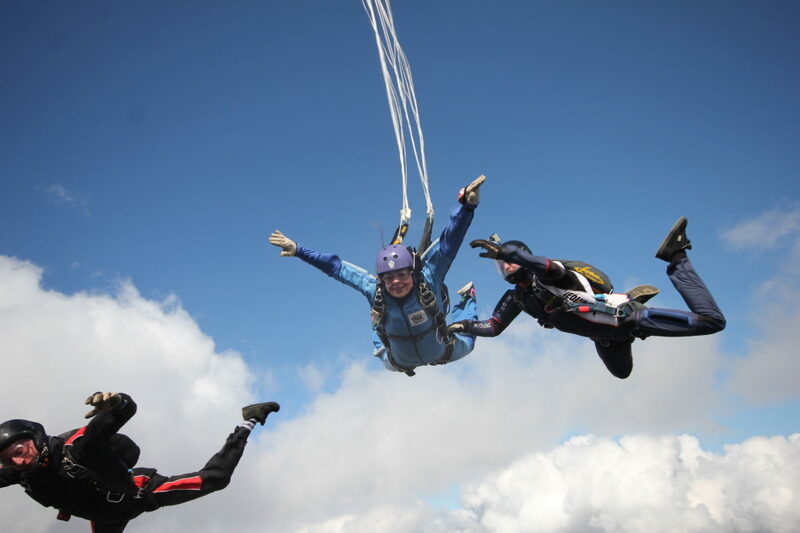 If you have booked our beginners package then your tandem jump will take place at a suitable point during the day. 8.30am refresher training with your instructor. Get kitted up and enjoy the 15 minute ride up to maximum altitude. Exit the jump aircraft with your two dedicated AFF instructors who each have thousands of jumps. 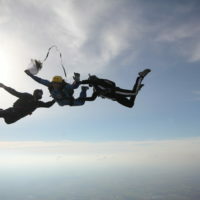 Receive in-air coaching from your instructors who will be falling alongside you holding onto your harness. Experience about one minute of freefall at 120mph and deploy your own parachute. 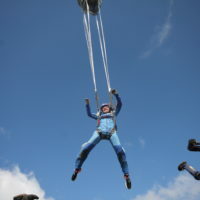 Fly and navigate your own parachute for around 5 minutes and then land back on the dropzone. 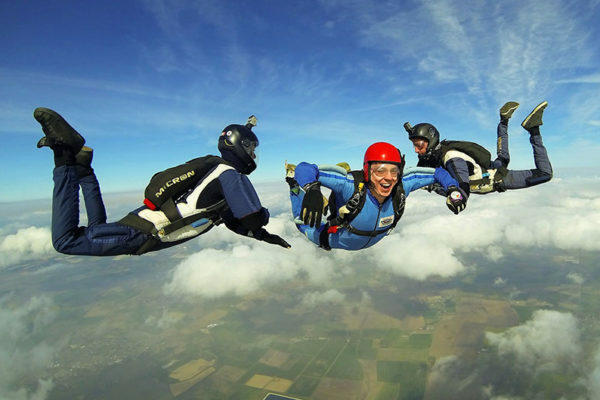 Meet with your instructors to debrief the jump and collect your solo skydiving certificate. The AFF ground training can be both mentally and physically tiring and it’s best to start fresh in the morning. 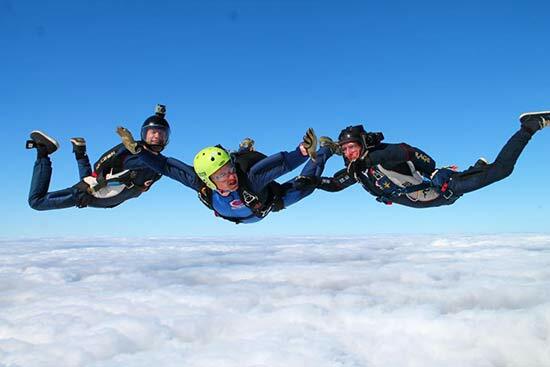 The ground training takes one full day with the Level 1 skydive the following day weather permitting We ask all students to commit to the initial 2-days Weds/Thurs (or Mon/Tues in Summer). For safety reasons we require you to return and jump within one month of your training. If you are doing your AFF L1 as a one-off experience you will still be required to commit the same level of effort into the training as if you were going to complete the full course. If you do not live locally then we strongly recommend staying onsite or nearby rather than driving a long distance before your course starts. 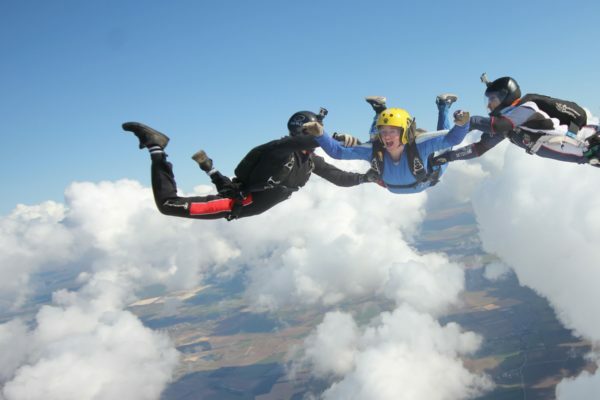 Please note that skydiving is a weather dependent sport and certain conditions are required for first-time jumpers – this can mean your skydive is delayed or has to be rescheduled to an alternative date. Find a List of local accommodation here. 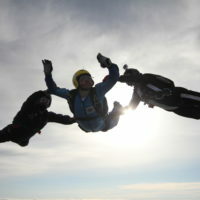 Skydive Hibaldstow has private and dormitory rooms available as well as free camping. Please see the link below for our prices page, we offer discounts if you come as part of a group! 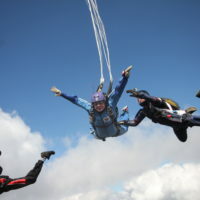 Your ticket to becoming a qualified skydiver! Includes temporary BPA gloves goggles & logbook manual. The same as the AFF Gold course, but with 3 nights in a B&B + external video. Runs on selected weeks only. 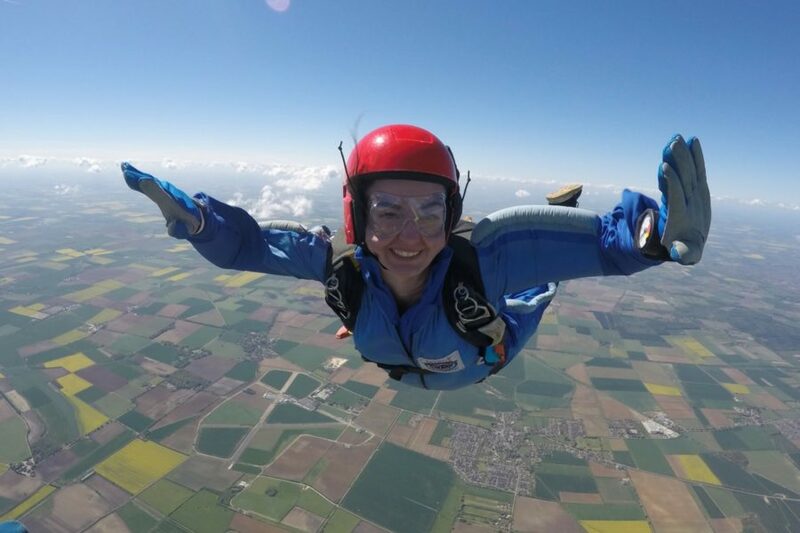 2-Day AFF Level 1 Training Course Includes Ground Training and AFF Level 1 Skydive from 15,000 Ft. A perfect gift voucher present valid for 1 year - simply pick a date of your choice! 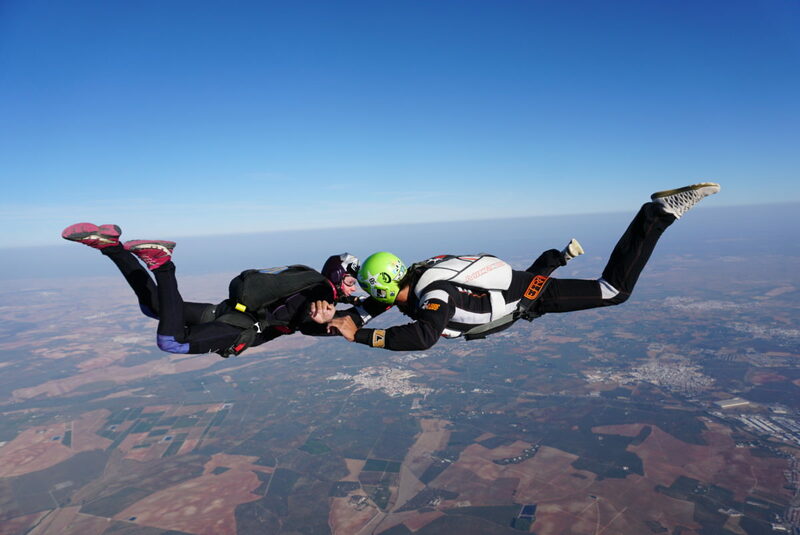 Read answers to the most frequently asked questions about our learn to skydive programs.